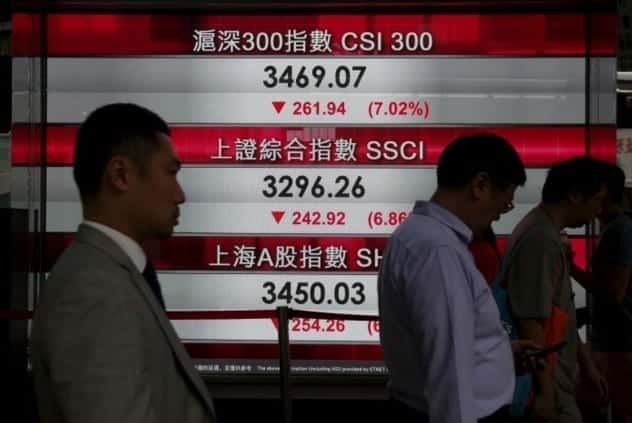 Trading was halted on China’s stock markets Monday after shares plunged 7 percent and triggered a new system in place to limit volatility. The Shanghai Composite Index dropped 6.9 percent while China’s benchmark CSI 300 Index fell 7 percent. The Shenzhen Composite tumbled by more than 8 percent. Trading was suspended earlier in the day for 15 minutes once the markets dropped 5 percent, but regulators ended trading early as as part of China’s new circuit-breaker mechanism. Under the new system, which was introduced in early December, moves of 7 percent from the last session’s close triggers a trading halt for the day. The mechanism came into effect for the first time Monday. This entry was posted on January 4th 2016 at 8:09am/08:09 and is filed under Business, Economy, Live News Column 1, World News. You can follow any responses to this entry through the RSS 2.0 feed.